This article is about the Personal Digital Assistant. For other uses, see Tungsten (disambiguation). The Tungsten series was Palm, Inc.'s line of business-class Palm OS-based PDAs. The Tungsten series was introduced in October 2002, created as a "prosumer" line priced at $199 to $300 to compete with the popular Sony Clie and Windows Mobile PDAs. The first device in the line was the Tungsten T, making it the first Palm PDA to be labeled with a letter rather than a number and to run Palm OS 5. All models except the Tungsten C, W, and E have Bluetooth. The Tungsten C has Wi-Fi and it is optional on the E2, T3, and T5 via the Palm Wi-Fi Card  placed in their SD card slot). With the exception of the Tungsten W, all Tungsten PDAs run Palm OS 5 "Garnet" on an ARM processor and have non-user-replaceable lithium-ion batteries. Some users replace battery packs with third-party units. The T3, for example, is shipped with a 900 mAh capacity battery but third-party 1100 mAh or 1150 mAh LI-poly batteries of the same physical dimensions are available. Tungsten models use a five-way navigator pad, in the shape of a rounded rectangle, circle, or oval and have four buttons for built-in applications. The Palm Universal Connector was used by the Tungsten T, Tungsten T2, Tungsten T3, Tungsten C, Tungsten W, for cradles and accessories, while the Tungsten E used a mini-USB connection; the Tungsten T5, Tungsten E2 and TX used an Athena Connector also known as the multi-connector. All Tungsten handhelds include Dataviz's Documents To Go office suite and some version of Kinoma Player, with the exception of the Tungsten W.
Palm's Tungsten E was the cheapest of the Tungsten series, and as such, has been one of the most successful. It has 32 megabytes of memory, a Texas Instruments OMAP (ARM) 126 MHz processor, a 2 1/8 x 2 1/8 inch (54 x 54 mm) transreflective TFT screen, and runs Palm OS 5.2.1. It is 4.5 by 3.1 by 0.5 inches (114 by 79 by 12 mm), and weighs 4.6 ounces (131 g). It has a standard 3.5 mm headphone jack and a speaker in back. It uses a mini USB connector not supported by most dock accessories. At introduction, it was US$199. The Tungsten E, released in October 2003, was intended to replace the aging Palm m515, one of the last holdouts from Palm's old product line. The Tungsten E, though, did not include a vibrating alarm and indicator light like the Palm m500 series had. Since it was released at the same time as the Tungsten T3, it includes the newer PIM apps and the enhanced "agenda view" for quick viewing of to-do items and upcoming calendar items. The Tungsten E has been one of Palm's strongest sellers since its introduction, to the point where its simple slate form factor prevailed over the Tungsten T series' previous slider form factor in the development of the Tungsten T5 and the TX. It was superseded in April 2005, when palmOne released the Tungsten E2. The Tungsten E2, introduced on April 13, 2005 replaced the similarly named Tungsten E, has 32 MB of memory (29.7 available), a 200 MHz Intel XScale processor, 320x320 Transflective TFT color display, and runs Palm OS Garnet v5.4.7. It is 114 by 79 by 15 millimeters (4.5 by 3.1 by 0.59 in) and weighs 133 grams (4.7 oz). It has a standard 3.5 mm headphone jack, a longer-lasting battery than the Tungsten E, has Bluetooth capability, and a single speaker on the back. Much like the Tungsten T5 and Treo 650, it uses non-volatile flash memory, this time in the form of Non-Volatile File System, meaning that the data will be preserved if the battery runs out. It uses standard SD memory cards and is also compatible with the Palm Wi-Fi Card (sold separately). It uses a standard Athena Connector port supported only by some new accessories. When it was released, its retail price was US$249. In October 2005, the price was reduced to US$199. Unlike other models, the Find function is limited to only the first eight matches, and the calculator incorrectly finds percentages at half their actual value, though this was fixed in units shipping after April 2006. The Tungsten E2 has the ability to use WiFi, but only as an add-on SDIO card made by PalmOne (now TCL Corporation). Palm's WiFi card is manufactured by SyChip. Encryption is restricted to WEP, the E2 does not offer WPA or WPA2. The maximum size SD card supported on the Tungsten E2 is 1 GB due to a software limitation. In order to read larger SD and SDHC cards an upgraded driver is required. The previous model (Tungsten E) has been reported to be capable of using 2 GB SD cards. The second Tungsten, the Tungsten T, introduced in November 2002 and known during development as the M550, was the first model to use Palm OS 5. The Tungsten T was designed by Palm engineers based in Arlington Heights, Illinois. is otherwise a standard Tungsten; see above. It is 4.0 inches (102 mm) tall, 4.8 inches (121 mm) tall with the slider extended, by 3.0 inches (78 mm) wide by 0.6 inches (15 mm) thick, and weighs 5.6 ounces (146 g). It sets itself apart from other PDAs physically by having a sliding lower portion; the bottom third of the casing can be slid up and down to cover or reveal the touch-sensitive Graffiti writing area. At introduction, it was US$499. Many of the features in the Tungsten T are Palm firsts. It was the first Palm PDA to use a version of Palm OS 5 and an ARM processor, which meant that it had the software and processing power for high-quality real-time video playback and MP3 playback. The slider feature was unique. When open, the Tungsten T looked like a normal slate-shaped PDA, but the bottom portion, with the five-way controller and four buttons, could slide closed, covering up the Graffiti writing area. This made it the smallest Palm PDA in height. The Tungsten T was the last Palm PDA to use the original Graffiti Version 1 handwriting recognition software. Because of a lawsuit by Xerox Corporation Palm Inc. was forced to discontinue Graffiti 1 and later Palm PDAs used Graffiti Version 2. The revised software required two separate strokes for entry of some letters of the alphabet, such as the letters "t" and "k". Most all of the other letters required strokes different from those used in Graffiti 1. Many veteran Palm users were unhappy with the new Graffiti. Palm's reasoning behind the slider was people spend more time viewing data rather than entering data. Thus, they chose to hide the data entry medium while not in use to make a more compact device. The slider caused two problems with the Tungsten T. One drawback was that the Tungsten T was notorious for needing frequent manual recalibration of the digitizer after about one year of use. A software patch issued by Palm has helped with this problem. The other problem was that the ribbon cable between the mainboard and the digitizer connectors that would change their resistance over time. The only way to (temporarily) correct this problem was to disassemble the PDA and remove and reinstall these connectors. The Tungsten T was succeeded by the Tungsten T2. The Tungsten T2, introduced in July 2003 for US$399, was simply a minor update to the Tungsten T, and had exactly the same form factor. (Save for the label and the T|T2's slightly lighter case color, they are superficially identical.) The memory was increased to 32 megabytes, the screen was replaced with a superior (backlight) TFT LCD of the same size and resolution, Palm OS upgraded to 5.2.1, Graffiti replaced with Graffiti2. Since it is much like the Tungsten T model, PalmOne did not deliver this model to some markets, such as mainland China or Brazil. The Tungsten T2 was discontinued in April 2004, having been succeeded by the Tungsten T3. The Tungsten T3 was the third T-Class Tungsten device, released in October 2003. It has 64 MB of memory (52 MB usable), a 400 MHz Intel PXA261 processor, a new 3.7" 320x480 transflective TFT LCD touch-screen, and runs Palm OS version 5.2.1. It was the last product designed by the Palm engineers in Arlington Heights. The T3 included Active Input Technology with Virtual Graffiti 2, a Virtual keyboard, and the typical Tungsten line slider. With many other additional features, the T3 was released with the same $399 retail price tag as the Tungsten T2 until the release of the Tungsten T5, when it was reduced to $349. Like the Tungsten T and T2, the T3 still has a front-facing speaker, microphone, vibrating alarm, indicator light, and all of their other features. Like the Tungsten E, the Tungsten T3 came with an enhanced PIM Suite which categorized all appointments and tasks on the Calendar (formerly Date Book) screen. The Enhanced PIM Software also has an improved Task suite (formerly To Do List) which can categorize Tasks by either urgency, category, etc., and an improved Contacts (formerly Address) application with picture support and more fields. Furthermore, a new status bar always appears at the bottom of screen, giving quick access to the time, system information, home, find, menu access, alerts, Bluetooth, full-screen writing, screen rotation, and what is shown in the input area. The Tungsten T3 comes with RealPlayer for Palm OS Handhelds (called RealOne Player for Palm OS Handhelds at the time of its release) in addition to a 3.5 mm Stereo Jack, making it a digital music player when used with a Secure Digital (SD) flash memory card. The T3 has a bigger, non-round, 5-way navigation pad with the four application buttons placed around it in a circular fashion instead of in a row, breaking Palm's traditional application button layout. Palm went back to its more traditional layout in the Tungsten T5 and Palm TX. The T3 has a Green/Red LED, but for reasons unknown Palm decided to use only the green LED. Red is only activated with certain programs and libraries. The T3 also has the Palm Universal Connector and an included USB cradle. The cradle is used for both charging and synchronizing the Palm's data to a PC (software is included for Windows and Mac OS X, but with the pilot-link software, the unit synchronizes perfectly with a Unix operating system). Early criticisms of the Tungsten T3 include it electronically damaging SD cards and its battery life (900 mA·h battery). Palm addressed the Secure Digital Card problem by releasing a Firmware Update. After the "SD Card Patch" was applied in early (by the user via a firmware patch) and later (at the manufacturing stage) releases of the Tungsten T3, no other criticisms were known to have risen from the Tungsten T3's use. Shortly after the early 2005 release of the Tungsten T5, the Tungsten T3 was discontinued. Since then, no Palm handhelds have included a vibrating alarm, a slider to make the device smaller, or the Palm Universal Connector. The Tungsten T5, introduced in October 2004 and now discontinued, is a combination of the Tungsten E and Tungsten T3. It is the first and only Tungsten to use a 416 MHz Intel XScale PXA270 processor. It has a 320x480 TFT 16-bit Color Screen with a virtual input area like the Tungsten T3 instead of a 320x320 Color Screen with a fixed input area used in the Tungsten E, E2, T, and T2. It retained the shape of the Tungsten E, but is slightly thicker, instead of the shape of Tungsten T series, where its name comes from. The Tungsten T5 is the first Palm PDA to have a 320x480 pixel screen that is all revealed instead of the "slider" used in the Tungsten T3, T2, and T, though other brands have had sliderless HVGA displays for years. It is also the first to have 256 MB of memory (versus 64 MB in the Tungsten T3), with 161.2 MB configured as a Flash Drive, 63.8 MB available for applications, and 31 MB reserved for the OS. This can result in some confusion since the memory is not equally usable as in the previous Palm PDAs. While the Tungsten T5 was meant to be a replacement for the Tungsten T3, it is missing several features from the Tungsten T3 such as a charge-indicator LED, vibrating alarm, included HotSync cradle, and built in microphone for voice memos. Furthermore, its speaker became rear-facing instead of front-facing and it uses the Athena Connector instead of the Palm Universal Connector. Power users also criticize the Tungsten T5 for its Tungsten E-derived form factor. The speed of the Bluetooth connection can only be set to a maximum of 128 kbit/s. At the time of its release, the Tungsten T5 (along with the Treo 650) was plagued with memory inefficiency problems, third-party application issues, and device driver crashes, due to the new Non-Volatile File System. Tungsten T5 owners were encouraged to install the Tungsten T5 1.1 Update, which addressed the memory inefficiency issues alongside other operating system-level problems. Issues/problems with the power-on switch have also been discovered, where it will not switch on unless a menu button is pressed or sometimes an SD card needs to be inserted. This is a known issue at Palm, but no fix is forthcoming. The best recommendation is to download a freeware program which can re-map the power button to one of the more reliable hardware buttons. In some countries, including Australia, the Tungsten T5 was withdrawn early since the Palm TX offered the highly desirable WiFi built-in, instead of having to use the optional Palm Wi-Fi Card in its one and only SD slot. Many non-Palm PDAs on the market at the time came standard with built-in WiFi. The Tungsten W (known as the i710 during its development period, and X420 at the prototype stage), introduced in February 2003. The only smartphone (PDA/cellphone hybrid) in the Tungsten series, instead of running Palm OS 5 on an ARM-compatible processor, it used Palm OS 4 with a low-power Motorola DragonBall processor, to increase the battery life. The combination of using a highly advanced lithium polymer battery and energy conserving electronics yielded longer battery life. Likewise, it had a thumb-sized keyboard, more like the Treo 600 than the flagship Tungsten T (This form factor would be reused in the Tungsten C). The Tungsten W focused more on its PDA half as opposed to its cellular telephony half, the focus of the succession of the Palm i705 and Palm VII. Unlike either the Palm i705 and the Palm VII (which both could only make data connections over the Mobitex pager network), downloads and uploads were done using comparatively-fast GPRS connections. It didn't have a microphone and the speaker couldn't be used for phone calls; instead, an included ear bud and microphone loopset was used for voice calls. A flip cover was released that allowed the user to hold the handheld like a normal phone and talk on it, although it did obscure the screen. (In the US, it was sold exclusively by AT&T Wireless, and all Tungsten W handsets sold in the US were locked to AT&T Wireless's service. Note, however, that Canadian W's are not locked to any service provider and can operate with T-Mobile SIM cards). It has 16 megabytes of memory, a Motorola DragonBall 33 MHz processor, a built-in microphone, vibrating alarms, indicator light, and runs Palm OS 4.1.1 (upgrade to 4.1.2 is available) with special enhancements for its hi-res display. It is 4.8 inches (121 mm) tall by 3.1 inches (79 mm) wide by 0.7 inches (18 mm) thick, and weighs 6.4 ounces (181 g). It has a standard 2.5 mm cellphone loopset jack, and a single speaker. The bottom half is a thumb-sized keyboard for typing, and it has no silkscreened Graffiti input area. (It is otherwise a standard Tungsten; see above.) At introduction, it was US$419 before service provider subsidies. 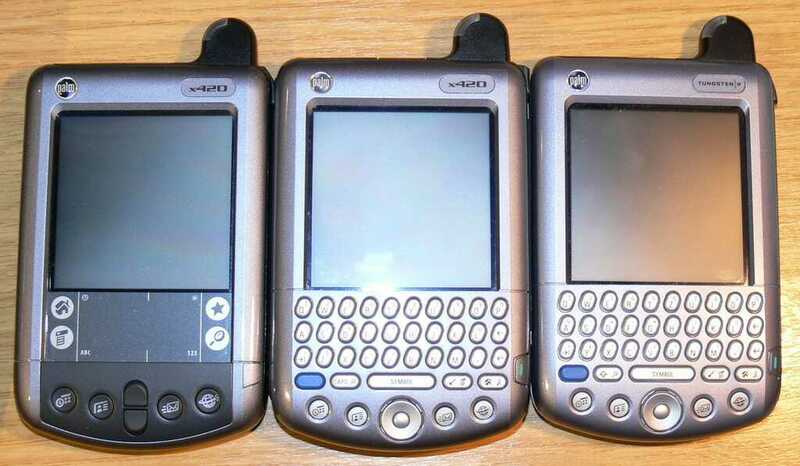 The Tungsten W was succeeded by the Treo 600 after Palm purchased Handspring and became palmOne. The Tungsten C introduced in April 2003 was, at the time of its release, palmOne's only handheld that allows the user to access the internet wirelessly through 802.11b Wi-Fi without the use of a card or other external device. It lacks support for the WPA encryption standard. It does, however, have built in PPTP VPN for a secure connection to a VPN server. The web browser is PalmSource Web Browser 2.0. Novarra Web Pro 3.0 can be purchased as an upgrade. Other details are its 400 MHz Intel PXA255 processor, 64 MiB of memory (51 MiB available for programs + 12 MiB heap), built-in thumb keyboard, a "five-way navigator," a Secure Digital/SDIO/MultiMediaCard slot, vibrating alarms, indicator light, and a 2.5 mm headset jack, capable of voice recording and monaural sound output with a proprietary earbud headset (sold separately). A cell phone headset with the same type connector has been tested to work. There have also been third-party applications and hardware that work around the Tungsten C's monaural audio. For instance, a special adapter can be purchased from PPC Techs to convert to a standard 3.5 mm jack that splits the mono output into left and right channels. The Tungsten C is no longer in production — it was superseded by the LifeDrive Mobile Manager, the Palm TX, and the Treo series. Palm TX, the first business-oriented Palm-branded handheld without the Tungsten moniker. ^ Such as PowerSDHC by Dmitry Grinberg. ^ a b "Palm Tungsten T Specs". CNET. Retrieved 2019-01-29. ^ "Palm Tungsten W Series Specs". CNET. Retrieved 2019-01-29. ^ "Palm Tungsten C Specs". CNET. Retrieved 2019-01-29. ^ "Palm Tungsten E Specs". CNET. Retrieved 2019-01-29. ^ "Palm Tungsten T3 - handheld - Palm OS 5.2.1 - 256 MB Overview". CNET. Retrieved 2019-01-29. ^ "Palm Tungsten T5 Series Specs". CNET. Retrieved 2019-01-29. ^ "Palm Tungsten E2 - handheld - Palm OS Garnet 5.4 Overview". CNET. Retrieved 2019-01-29. This page was last edited on 14 April 2019, at 16:58 (UTC).